This App allows to Read Deleted WhatsApp Messages. Read Deleted WhatsApp Messages – There is no doubt that WhatsApp is most popular and widely used instant messaging App. Although there are tons of WhatsApp Alternative Apps available, still, not an app can take place of WhatsApp in messaging. A few months back WhatsApp launched new status feature and everyone like that feature. And recently WhatsApp rolled out a new feature – Which allows deleting WhatsApp messages you’ve sent by mistake. Previously this feature was available only for the beta tester but now it’s available for all users. But recently, a Spanish blog find out a way to Read deleted WhatsApp Messages, which is sent by mistake. This method allows recovering deleted WhatsApp text messages only, not images or videos. But still, if you want to read message deleted by your friend after sending by mistake. Then this post will might helpful for you, So follow this post to find out “How to Read Deleted WhatsApp Messages“. 1 How to Read Deleted WhatsApp Messages. 1.0.1 Recover deleted WhatsApp Messages sent by Mistake. The Latest version of WhatsApp allows deleting sent WhatsApp by mistake. You can delete the message sent in last 7 minutes. After 7 minutes option will automatically get disabled, and you can’t delete the message. To Delete Message tap and hold a message for few seconds and three option will appear on the screen. Choose “Delete for Everyone” and the message will get deleted within a second. And another person will get a notification “This message was deleted“. 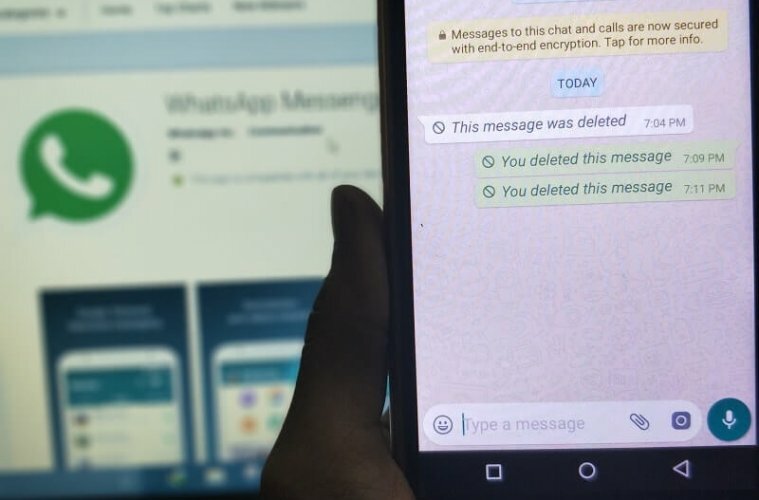 How to Read Deleted WhatsApp Messages. WhatsApp officially not provide any option to recover deleted WhatsApp messages by your friends. 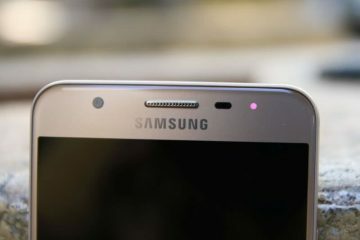 But there are few apps available for Android, which records notification log of the device. So when you receive message notification, this app record message from notification instantly. It doesn’t matter message is deleted or not, this app record all apps notification log. Recover deleted WhatsApp Messages sent by Mistake. 1 Download Notification History App from Google Play and open it, Now app will ask you to allow permissions. 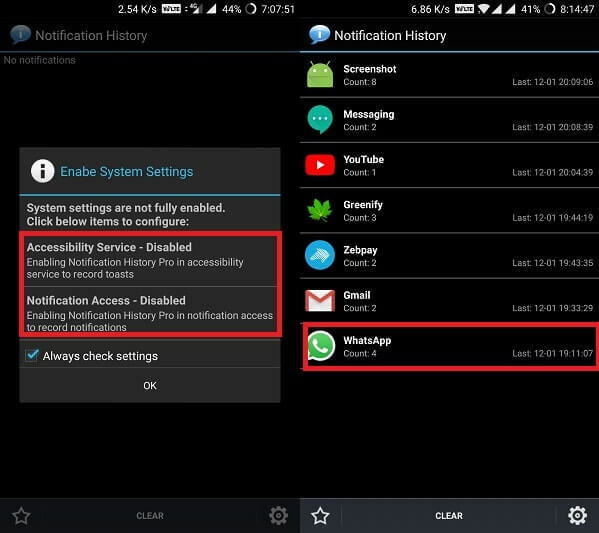 2 First, tap on Accessibility Service and Enable Notification history app. – This option will allow the app to record USSD, Messages, Dialog, App toasts and notification on the status bar. 3 Press Back button to go back into the App and now tap on notification access and enable it. 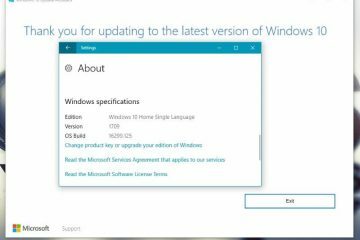 – This option will allow the app to record all your upcoming notification. Done, Now whenever someone sends you message and delete it. 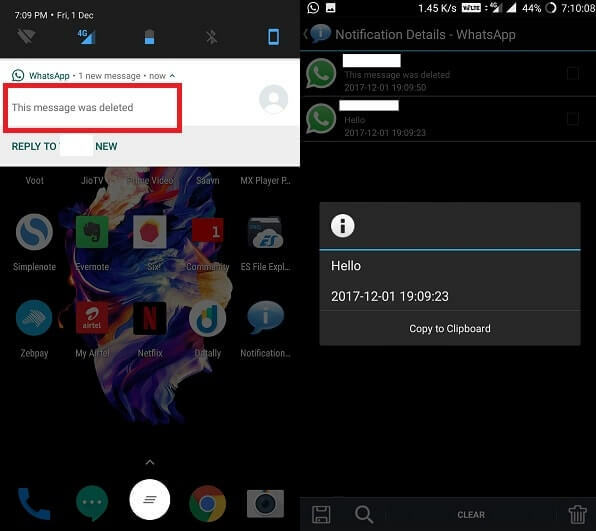 You can easily read deleted WhatsApp Messages by going into Notification History App> WhatsApp. Note: Don’t force close notification History App by using any other third-party App. Otherwise, App functionality will stop working. 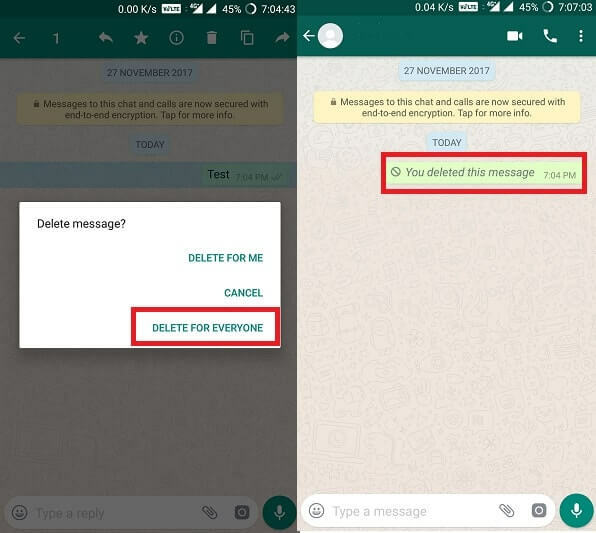 Is new WhatsApp Message Delete feature is useless?. No, not at all. WhatsApp did a great job by providing this most awaited feature in App. And am sure in upcoming updates WhatsApp will fix this notification log record issue. Well, it is not a bug there are some other apps that offer the same feature. And with the help of notification history app, anyone can read those apps deleted messages too. And you don’t need to worry about deleted messages till now. Because this method is new and not everyone knows about it. So, this is the App that allows read deleted WhatsApp Messages. This App is not, specially designed to recover WhatsApp messages. This App is develop for “Collecting messages sent by Apps, so we can read them later”. Sometimes we accidentally clear all notification from the status bar, and later we want to read any important notification. You can also use this App to recover deleted SMS. Overall this is the best method to read deleted messages of WhatsApp. If you know any other better App or way to recover then feel free to comment. Previous ArticleFix Packet Loss – Check Packet loss causes and solutions. 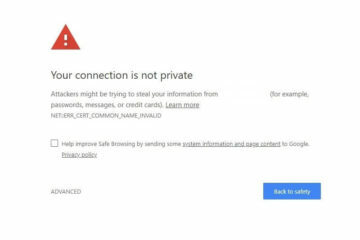 Next ArticleHow to stop Apps from using Data – Data blocker App.